The loss of an adult sibling doesn't get much attention in our society. After all, it's not someone's parent or spouse who died. Yet the death of a sister or brother is a unique and difficult loss, according to Fredda Bruckner-Gordon, D.S.W. "When you lose a sibling, you're losing the only person who shares the same memories. This is the person who goes back the longest in your life," says Dr. Bruckner-Gordon, a family therapist in New York City. Think about it. Who else remembers the family trips to the shore in the summer — or the day your father got fired, or your sixth-grade teacher. These memories (good and bad) helped shape you. They are part of the fabric of who you are. What a blow when the person who knows and understands is no longer here to validate your own experiences and/or broaden or soften your recollections. Of course, it makes a difference whether the sibling relationship was a good one, and whether issues were resolved or not resolved. Some people spend their whole lives resenting siblings or feeling cheated by siblings who were favored by the parents. "It's a huge loss if you have resolved such issues and were close. If you have, it makes a tremendous difference because you're not likely to repeat patterns in the family of origin," says Bruckner-Gordon. Your situation can be ticklish because you know little about the nature of the sibling relationship. The best thing to do is take a neutral position and talk about the death in the way you would any loss. A touch on the arm and a few words like, "I'm so sorry. This must be very hard," can bring comfort. It's also important to pause, allow the bereaved to talk, and simply listen. You can respond differently when you're a close friend and know the background and what the relationship meant to the person. But either way, a loss is still a loss that calls into question the bereaved person's own mortality, especially if she or he is older. Someone who outlives siblings (and friends) can feel very alone in the world. 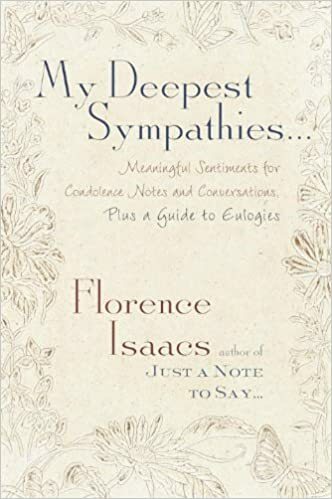 Florence Isaacs is the author of several books on etiquette, including My Deepest Sympathies: Meaningful Sentiments for Condolence Notes.... She writes two advice blogs for Legacy.com: Sincere Condolences and Widow in the World, a blog for bereaved spouses and partners.